Engine Four stroke, 45° V-Twin, OHV, 2 valves per cylinder. Front Wheel Travel 92 mm / 3.62 in. Rear Wheel Travel 41 mm / 1.6 in. Wheelbase 1519 mm / 59.5 in. Unladen 683 mm / 26.9 in. The Harley-Davidson Iron 883™ pushes minimal Dark Custom styling to the edge with a V-Twin beat and gritty, old-school garage features. The low MSRP makes this model a great starting point for customization. Born on the gritty dirt tracks and drag strips of the 1950s, the Harley-Davidson® Sportster® represents the uninhibited essence of motorcycling. 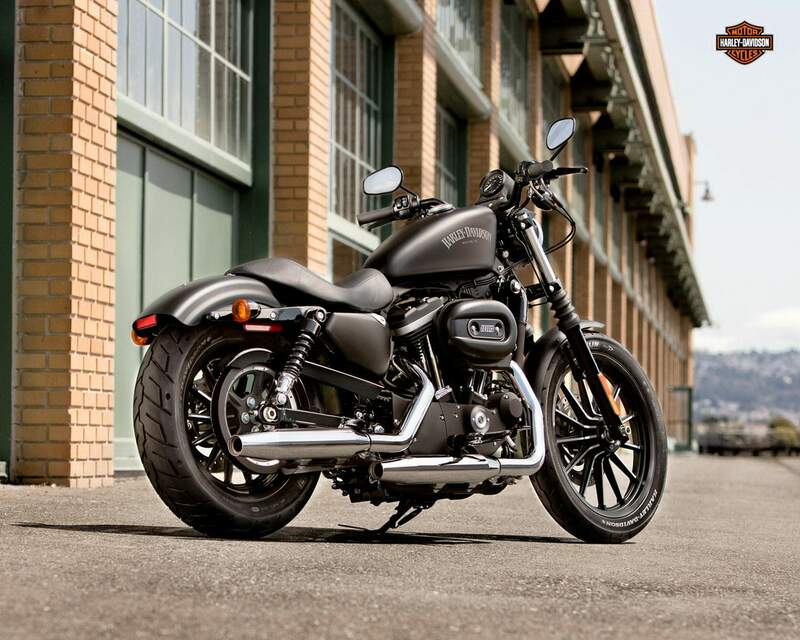 The Iron 883™ takes attitude to a dark place. Reflecting the style of riders who want a quality ride with no hassles, the blacked-out, back-alley bruiser is the “anti-chrome” Harley® model. 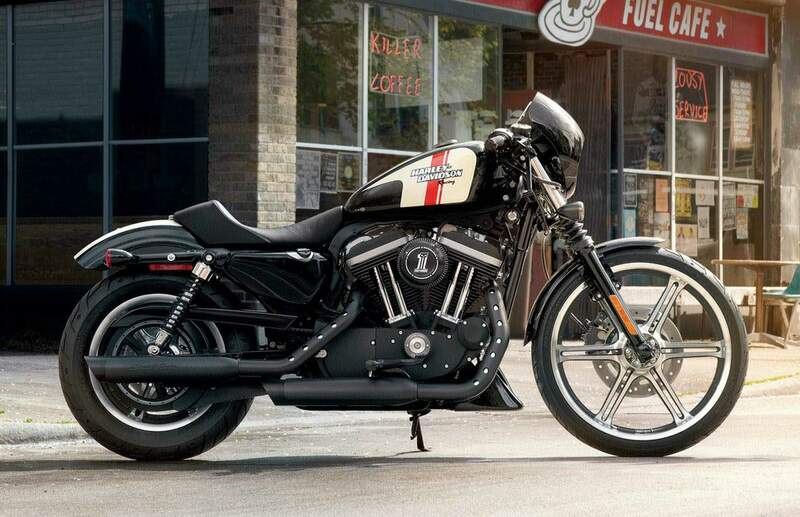 The Iron 883 is for those who want their first taste of that ride-hard-and-put-up-wet lifestyle. It’s for those who want to tear up asphalt and backroads instead of polishing paint and chrome. 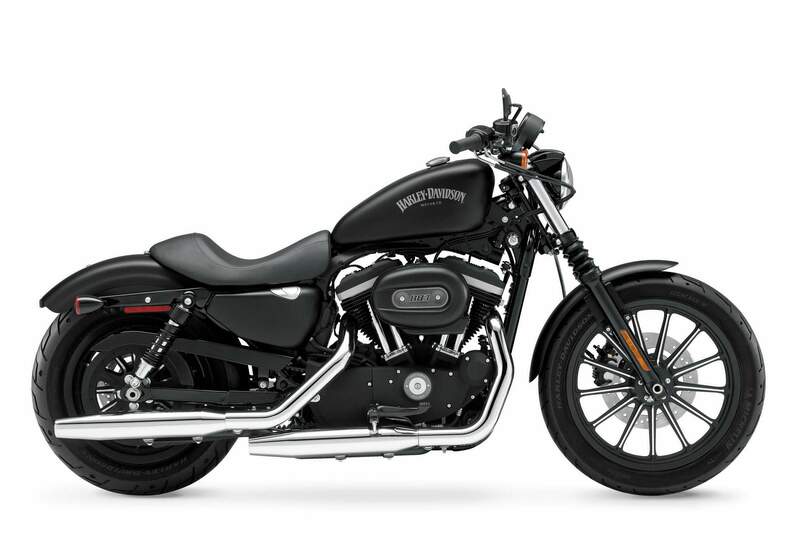 With straight cut, dual shorty mufflers, a slammed, drag-style handlebar, front fork gaiters, chopped rear fender and solo seat, the Iron 883 is a raw, stripped-down, aggressive bike that gives the rider an authentic, throwback riding experience. And with a very aggressive price point, it makes a perfect gateway into the world of Dark Custom™ motorcycles. The low-rise, slammed black drag-style handlebar and black finish hand controls add to the stripped down, minimal look of the Iron 883™ motorcycle. Born at the drag strip, the drag-style handlebar is an old school garage feature that puts you in a forward, aggressive riding position. All Harley-Davidson® fuel tanks are finished by hand—that's what makes them stand out from the competition. Their seamless design and unmatched style are unique among all motorcycles on the road. The tanks are one of the first and last things people notice when they lay their eyes on a Harley-Davidson® motorcycle—so we make it worth their time. Feast your eyes on the 883cc Evolution® engine and there's no mistaking its roots. This is authentic Harley-Davidson style through and through with an attention to detail you won't find from any other motorcycle company. Black powder-coated cylinders, cylinder heads and rocker covers complete the dark look while chrome pushrods highlight the iconic V-Twin. It's a jewel machined out of metal. Pure. Dripping with power. From the classic edge of the cooling fins to the clean lines of cases and covers—the 883cc Evolution® engine makes an ironclad statement to holding on to what's right and staying true to what satisfies the rider. Harley-Davidson® motorcycles are different from any other bike out on the road. There's a balance to them. The steering, the maneuverability—it's all in concert. And each Harley-Davidson® model is tuned differently to create a unique riding experience for each individual no matter which bike they swing their leg over. Let's face it, we didn't get to where we are by being like everyone else.